A new HorizonPoll finds what New Zealanders would most want to buy from Sky TV - if the company didn't require them to have a basic package. A national survey by Horizon Research in Feruary 2018 finds adults would most buy movies, documentaries and sports content. The survey also finds Sky's current subscriber number might shrink from 778,776 to about 433,000 "definite" or "most likely" buyers - if they could choose to buy only what they wanted. The results indicate an opportunity to grow the number of adults buying from it, but also great potential risks of losing subscribers if it's not competitive on price and content offerings - should it ever unlock all customers from basic packages. Here is what New Zealanders said when asked: If Sky TV were to offer you an opportunity to buy just the services you wanted, without a compulsory Basic package, which ones would you buy? Horizon also asked how likely respondets were to buy a Sky Tv product (e.g. movies, documentaries, sport) if they could do that without having to buy a Basic package. This indicates a core Sky TV market of around 443,000 - about half its customer base at December 2017. The results from both questions indicate potential for Sky TV to grow its subscriber base by removing the need for subscribers to buy a Basic package as well. 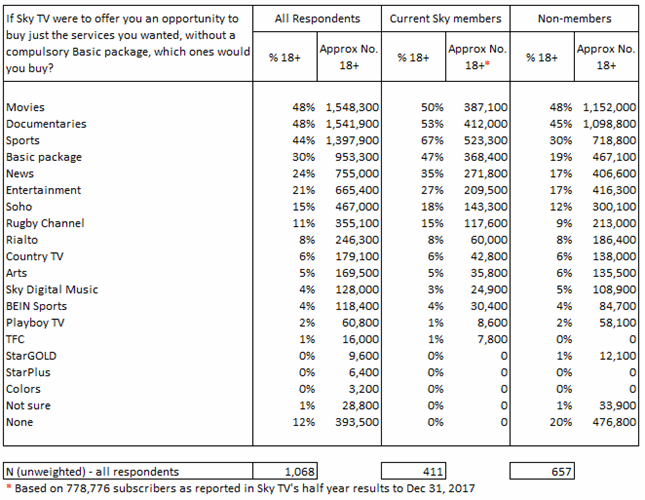 The survey was conducted before Sky announced it was introducing an option to split its basic package in two and require subscribers to buy one, not both. Horizon Research surveyed 1,099 adults nationwide between February 8 and 13, 2018. The survey is weighted by age, gender, educational level, personal income, ethnicity and party voted for at the 2017 general election to provide a representative sample of the 18+ population at the most recent census. At a 95% confidence level the maximum margin of error is +/- 3.1%. It also reveals the number using various Sky services and apps and how many New Zealanders and current Sky subscribers would like services like Netflix and Lightbox bundled with their subscriptions.